Sharjah, 18, August 2018: The 6th group, has been titled champion of an educational programme series, ‘Little Chef’, organised by Ministry of Health & Prevention (MoHaP) and Sharjah Girl Guides (SGG). Concluded yesterday (Thursday), the programme brought its 28 participants together in a creative environment to teach them what constitutes a healthy diet and lifestyle. The programme also engaged the girls (aged 9 to 11 years) in interesting cooking exercises during which they learned about a variety of nutrient-rich foods and ingredients, and ways to turn them into their favourite dishes. 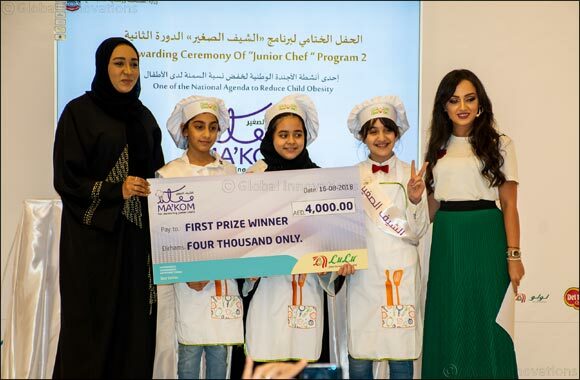 One of the core objectives of the programme was to help children understand the connection between their dietary choices and their health, and how they can make the right food choices to combat obesity – a growing epidemic in the UAE and around the world. Held for three weeks from July 23 to August 16, the programme targeted 14 participants each from SGG and MoHaP, who were divided into seven groups, and competed to win first and second places in the final competition that brought all 28 together at the Lulu Hypermarket in Al Hazzana area yesterday. The programme comprised a series of workshops like ‘Healthy Foods’, ‘Healthy Shopping’, and ‘Healthy Snacks’; a trip to the Del Monte food production company, and two healthy cooking workshops with professional chefs. The programme ended with the final competition held at Al Lulu Hypermarket last Thursday for its 28 participants. “The cookery competition was very exciting and really allowed participants to tap into their potential, play with several ingredients and express themselves creatively. We were fascinated to see the high level of expertise and kitchen hygiene standards the young chefs brought to the table. Competition was neck-to-neck and selecting winners was anything but easy. Every dish presented to us tasted excellent! We truly hope these girls as well as all of the UAE’s youth will make healthy eating and exercise a cornerstone of their life,” she added.